“Draw near to God, and he will draw near to you.” As I was reflecting on our readings for today’s Jubilee Mass, I kept coming back to these words from St. James (cf. Jm. 4:1-10). Clearly, holiness, our holiness and that of our people is achieved by daily drawing nearer to the Lord and by drawing closer to one another. In our priestly ministry, our nearness to Jesus is made more intimate as we draw closer to God’s people. We remember that Jesus chose to be close to His people. Pope Francis, in his Chrism Mass homily, told us that “closeness is an attitude that engages the whole person, our way of relating, our way of being attentive both to ourselves and to others.” Even for strong introverts like me, an attitude of closeness is important. The Holy Father said that “a priest who is close to his people walks among them with the closeness and tenderness of a good shepherd.” There should be no room for distance between a priest and his people. Dear brothers, you have a remarkable reputation for being close to your people and for that I am inspired and most grateful. You know that all the hard work and time that you expend in the pastoral planning process, ultimately, can be a means for closeness for the members of the local family of faith or it can be the occasion for alienation. We really do desire to love all our parishioners, to see them with the eyes of Christ. A collaborative spirit allows for a certain nearness to develop in a parish family. Prophets, visionaries and priests all benefit from collaboration. I’m convinced that pastoral leadership today must be accomplished in a collaborative spirit. Soon after I became Bishop, as you know, I decided to begin our Envisioning Process. I knew that we have many gifts and certain challenges in the Church of the North Country and I don’t have all the answers, bishop or not. So, with collaborative intent, I formed an Envisioning Team to help me focus our energies and limited resources to help build up the local Church. Collaboration is more than information sharing. It’s not simply the presentation of my vision or offering a polite nod while responding with a pleasant smile to the person who’s speaking. When collaborating, a certain humility and vulnerability is demanded from every person. The motivation for one to collaborate is not to force others to see things my way. Of course, I’m not speaking here of Church teaching. We don’t negotiate the truths of our faith. But, an openness of mind, heart and spirit is part and parcel of the collaborative experience in decision-making. Collaboration is hard work and can be very frustrating. Those who collaborate must be informed, active listeners where all possess the same common goal. It would seem to me that the pastor who engages in collaborative ministry should have a well thought out vision to offer and a willingness to reconsider or modify his ideas when good, thoughtful discussion develops into better alternative suggestions to be implemented. The leader should see the process through and genuine dialogue is the means. As leaders in the Church, we embrace the collaborative model as our decision-making process because it best respects every human person by providing the way by which everyone around the table feels seen, heard, and valued. The good shepherd is not afraid to make himself vulnerable, possessing the attitude and providing the environment where real dialogue is the norm for pastoral decision-making. That doesn’t mean everyone walks away from the table the best of friends, but it does mean the shepherd sought the nearness, closeness to his parishioners, so necessary for any healing to begin. Now, collaboration is not just listening to the crowd and following what everybody is saying. That’s not pastoral leadership. You know, I’m sure, no matter what we do, we just can’t please everybody. But, we try to work together, supporting one another in our common journey to the Father. Collaboration enables ideas to be shared and decisions to be owned and embraced by as many as possible. In our decision-making process, we either make Jesus present in the messiness of life or let Him remain on the level of ideas, pious words on a page in our homily, incarnate at most in some good habit gradually becoming routine. May we never succumb to performing correct routines, but in the process grow more distant from our people and our God. We draw near to God’s people, so that we and they might draw near to God. I suppose this is another way of describing servant leadership. 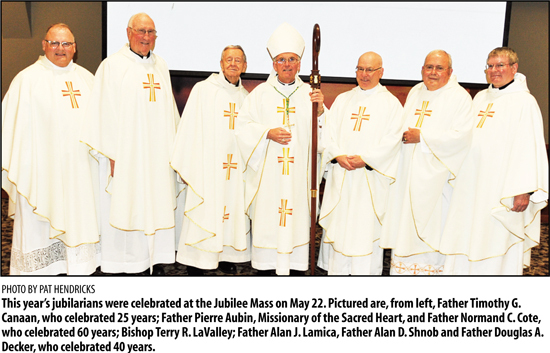 We acknowledge and thank our jubilarians for their servant leadership as priests of God these many years: 60 yrs: Pierre Aubin and Normand Cote; 40 yrs: Douglas Decker, Alan Lamica, and Alan Shnob; and 25 yrs: Timothy Canaan. We are all pilgrims on the journey, brothers on the road, here to help each other and our sisters and brothers to walk and bear the load as we try to draw ever nearer to Jesus, who is the Way, the Truth and the Life. Through it all may God be praised…forever may God be praised!